The LSU Alumni Association is a nonprofit organization whose mission is to meaningfully engage LSU alumni and friends to help them thrive professionally, socially, and philanthropically; and ultimately strengthen their bonds and support to LSU and to each other. The LSU Alumni Association supports the University in the pursuit of excellence in teaching, research, and public service to future and current alumni through social and professional networking events, scholarships, and professorships. The LSU Alumni Association is a member of the Alumni Professionals of the Southeastern Conference and the Self-Governing Alumni Forum; it is supported through self-generated income and donations from graduates, former students, faculty and friends of the University. HOw do i contact lsu tiger advocates? WHEN is Louisiana LEGislative Session? The 2019 Regular Legislative Session will convene at noon on Monday, April 8, 2019. Final Adjournment no later than 6:00 pm on Thursday, June 6, 2019.
does it cost anything to join tiger advocates? There is no cost to join Tiger Advocates. Once you SIGN UP, please confirm / update your information in the user profile page and "sign the petition" to submit those updates. That will ensure that the software matches you to the correct officials and that further actions you take here will be as quick an easy as possible! When an issue arises, we'll send you an email or text with a personalized link that will take you to an advocacy campaign where you will see the description of the issue at hand, who we need you to contact, and a suggested message. Your information will already be pre-populated, so all you will need to do is click one button to send the messages. With just a click, your legislators will know that LSU TIGER NATION is closely monitoring legislative decisions that impact the future of LSU and over 49,000 of our state's most gifted future alumni. How do i message a politician? Once you've registered, you can go to "Find Politicians" on the Tiger Advocates homepage. Once you've entered your address, zip code, and whether you'd like elected officials or candidates, a directory of federal and targeted state officials will show up. Select the officials you would like to message and click "Compose Message" at the bottom of the page. Compose your message, review your profile information and click "Send Message" when you're ready to send! Click here for a list of "Tiger legislators" (LSU alumni, former students and/or faculty members). IS TIGER ADVOCATES A PARTISAN PROGRAM? No. LSU Tiger Advocates is nonpartisan. Our goal is to protect LSU's status as a university of the first class. The LSU Alumni Association is a privately funded nonprofit organization. We organize, inform, and mobilize alumni and friends of the Louisiana State University to advocate on its behalf and to support higher education. 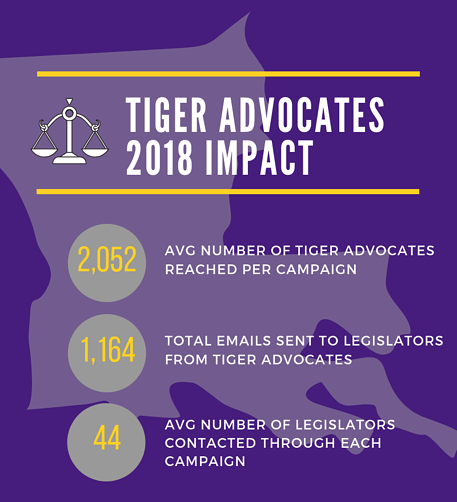 The LSU Tiger Advocates are alumni and friends who devote their time and attention to urging legislators and other decision makers to consider carefully individual bills or other matters that affect the university. The inclusion of links or pointers in particular to legislative items is not intended as an endorsement or recommendation by LSU. Does the LSU Alumni association endorse candidates? No, the LSU Alumni Association does not endorse candidates due to state and federal guidelines for tax-exempt nonprofit entities. Our advocacy efforts are focused on preparing alumni to communicate with decision makers on issues that directly affect the university, and providing tools to help them participate in the civic process. HOW CAN I GET INVOLVED WITH TIGER ADVOCATES? Sign up as an official Tiger Advocate and receive updates on the issues most important to the university. Follow us on Twitter and like us on Facebook for timely updates related to higher education at LSU and in the state. Look through our Briefing Room for media coverage of today’s top issues. Look through the LSU Media Center for updated university press releases. Attend LSU Legislative events. Check our calendar for upcoming events! CAN I BECOME A TIGER ADVOCATE IF I DIDN'T GRADUATE FROM LSU? Yes! All alumni and friends of LSU are welcome and encouraged to sign up as Tiger Advocates. It is easy and free and you’ll start receiving updates on important issues, calls to action, and invitations to special events. What is the time commitment for a tiger advocate? The commitment for a Tiger Advocate is up to you. You will receive updates on priority issues and developments from the legislature. From time to time, there will be calls to action, from calling your state lawmaker to invitations to legislative events.